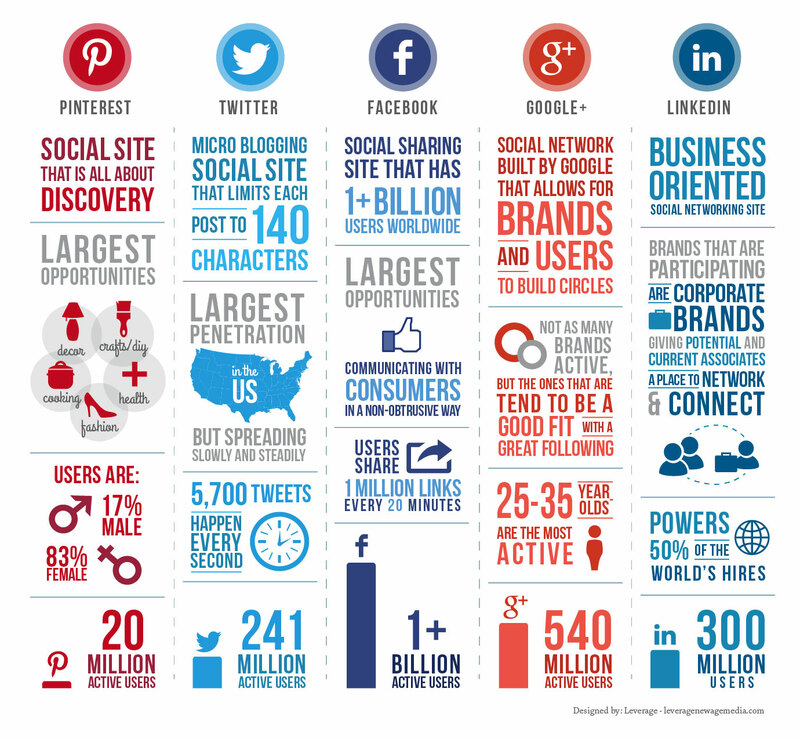 Top 5 Social Sites For Social Marketing [Infographic] | GUI Tricks - In Touch With Tomorrow! Top 5 Social Sites For Social Marketing [Infographic] - GUI Tricks - In Touch With Tomorrow! As we know, every blogger wants organic traffic and in my views, nothing is better than social media sharing. Only Google is not enough to grow traffic. Because at start, no any blog SEO optimize. We have to work hard and try to grow traffic from different ways and Social media sharing is the first way that every blogger should follow. But here’s a fact that to grow organic traffic, selection of right Social media for sharing is very very important. Every newbie when starts blogging then mostly don’t know that which social site is better for sharing? I remember, when I started my blogging career, then didn’t know seriously which is better or not? My concept was that no know is better than Facebook and by sharing my contents on facebook and its groups, I can increase my traffic. So that was a biggest mistake. Because I shared lots and too much on facebook, but result nothing. So it’s very important to know about social media sharing and necessary to know which Social network is best for bloggers. I shared below top 5 social network. I know you’re aware about them. But it’s important to know deeply about them. So must read facts of them and get interesting informative stuff. "The Power of Social Media is when it is built on top of real activity." Facebook is the best platform where you can easily promote and market your contents. It was launched on February 4, 2004, by Mark Zuckerberg with his college roommates and fellow Harvard University students Eduardo Saverin, Andrew McCollum, Dustin Moskovitz and Chris Hughes. This is a number one social network because it has 890 million active users and they use it on regular basis. So you can promote your business by creating pages, groups etc and can easily increase organic traffic. You can share your posts on your timeline, page timeline and its groups. So your priorities should be to use facebook first and then think about to use any other network. Here’s an important note that never market your contents exceedingly. I mean never share your posts more than 50 or 60 groups at a time. Similarly, share your contents on your created page maximum 10 or 15 in a day. Because spamming people share too much. So if you’ll do like this also, then you’ll consider as a faker or scammer that’s very effected for you and your blogging. Twitter is on second position in my list. It allows to users to send and read short 140 words or character messages that’s called ‘Tweets’. Twitter is really best for links sharing. Registered users can read and post tweets, but unregistered users can just read. If you’re using twitter for business then always try to connect with your category people. Increase your network or connections wide as possible. Never think about any spam. Because once you became scammer in views of other, then no one would like to connect with you and from this way your business will also be considered as a spam. According to the Twitter, it has more than 500 million users, out of which more than 284 million are actives users. So, I think this fact is enough for attraction and you may understand, why Twitter is also best after the Facebook. Google+ is a social networking service from Google. It's similar to the Facebook that is the best and advanced looking social networking site, it adds to all of Google's other services, including Gmail, YouTube, and Blogger. Google+ brings popular social-media features like comments, photo- and music-sharing, videochat, etc. to your social circles. So due to the connection from all the networks, it has a great advantage that million of people are connected. Million of users are active today and it's really another excellent way to share your blog posts. It has also a great advantage that your posts will also show in the result of Google, if you share on Google+. So you can think that if your post show on the Google search engine then you can increase your organic traffic quickly. It's one of the best too. LinkedIn is a business-oriented social networking service which was founded in December 2002 and launched on May 5, 2003, it is mainly used for professional networking. Means it is basically designed for networking. Bloggers and online marketers should have a best choice. Million of people also active on LinkedIn who belongs to the Blogging, marketing etc. So the meaning is simple. If you're a blogger and want to grow your business then Linkedin is seriously a best way. I hope you got my point. Pinterest is quite different from other. It is a web and mobile application company that offers a visual discovery, collection, sharing, and storage tool. Users create and share the collections of visual bookmarks (boards). Boards are created through a user selecting an item, page, website, etc. and pinning it to an existing or newly created board. Users save and share pins from multiple resources onto boards based on a plethora of criteria, e.g. similar characteristics, a theme, birthday parties, planning a vacation, writing a book, interior decorating, holidays. Boards can develop projects, organize events, or save pictures and data together. The site was founded by Ben Silbermann, Paul Sciarra and Evan Sharp. It is managed by Cold Brew Labs and funded by a small group of entrepreneurs and investors.